“Multisoft systems” is offering a special academic and corporate AngularJS training. It is a leading industrial, academic, and corporate training center in Noida. 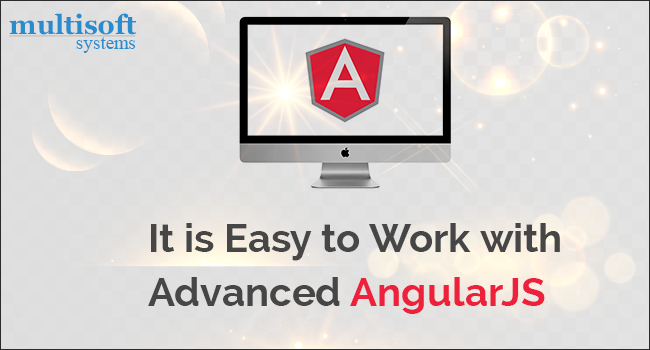 We provide a corporate environment with free Wi-Fi campus training facility with AngularJS in Delhi/NCR. AngularJS is user-friendly i.e. you do not need to write the same code again and again, here is a facility to write lesser code and it allows you to reuse components. Also, it provides an easy way of double-sided bindings and dependency installation. Here is a facility of two ways programming i.e. changing data will automatically change element and changing element will automatically change the data. It provides a facility to validate forms and input fields before submitting it without writing a single line of code. Allows you to control complete DOM structure (The Document Object Model (DOM) is an application programming interface (API) for valid HTML and well-formed XML documents. It defines the logical structure of documents and the way a document is accessed and manipulated). AngularJS allows you to write basic flow end-to-end testing, unit-testing, UI mocks. In short, we can say it provides all the features we need to design a CRUD application, reusable HTML modules, and most significantly dependency subparts. Apply event handling, Animation effects and all the tasks that are important as per industry.